Of all the blogs I've written in the last year, the one with the most visits is Sensual Art Nouveau. Does this portend something in terms of a style trend? Mid Century Modern has been the most recent design craze, which can be characterized by its simple shapes and clean lines. So what of Art Nouveau with all it's curls and curves? Maybe we need a break from straight lines, and long for the kind of curves that you want to touch. These three lots from the upcoming Bonhams Los Angeles auction February 6th and 7th would nicely decorate an Art Nouveau living room. On the left is a four piece walnut salon set after a design by Louis Majorelle. This is Lot 7465, and has an auction estimate of $2,500 - $3,500. The carving and wonderful shapes scream Art Nouveau. For some architectural interest in your Art Nouveau living room, add this pair of gilt bronze mounted mahogany pedestals. They are Lot 7141 in the Bonhams sale, and stand 51.5" tall. They have an auction estimate of $1,000 - $1,500. Place these on either side the settee and put two Galle vases on top and you have a wonderful display! The swan heads and curvy decorative detail are wonderful. Every living room needs a magazine rack and this one is so cute. This is Lot 7383 in the Bonhams sale, and has an auction estimate of $150 - $250. 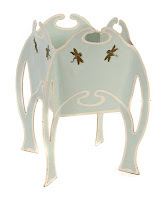 It is described as painted wrought metal, and stands18.75" tall. The swirly painted details and bees make this a wonderful Art Nouveau decoration. 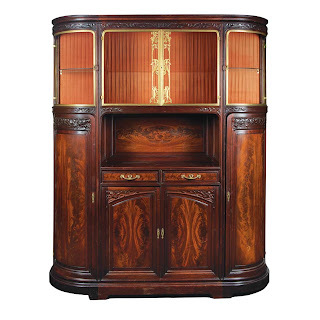 If your living or dining room is big enough, this French carved mahogany buffet is a beautiful example of Art Nouveau. This is Lot 468 in the Doyle New York 'Belle Epoque' sale February 9th. 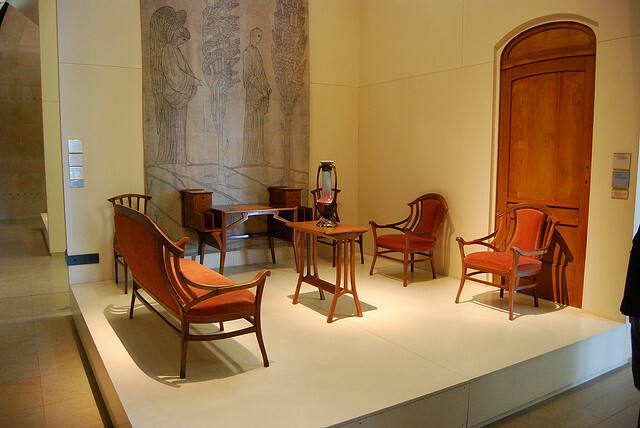 It is attributed to Louis Majorelle, and has an auction estimte of $6,000 - $8,000. It stands 7' tall and is 5'10" wide. 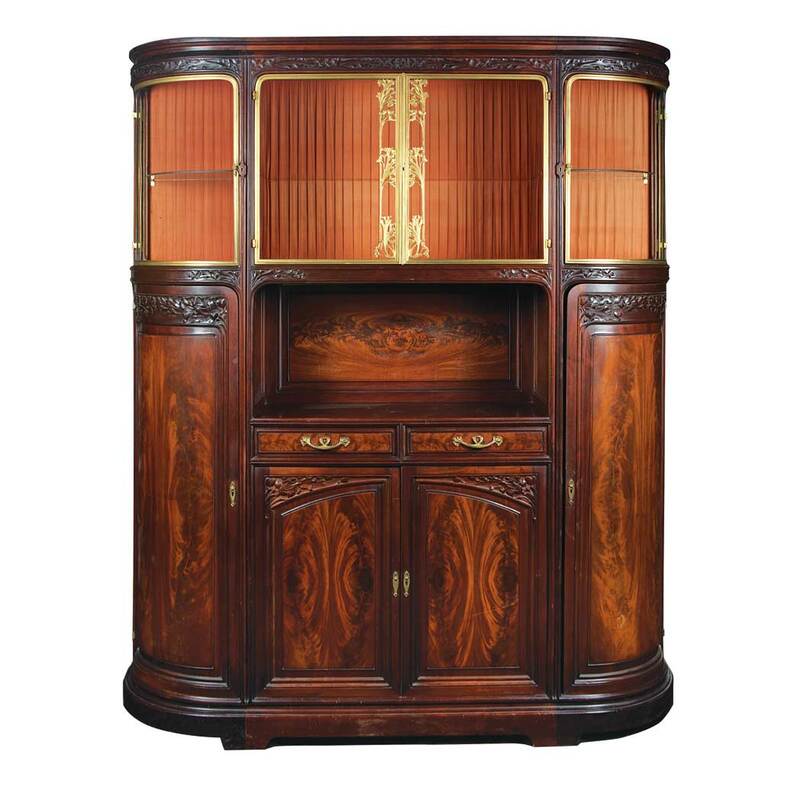 The detail in the wood grain, and the lovely decorative details make this a very handsome piece. Our living room needs a mantel clock and this gorgeous gilt metal example is Lot 548 in the next Christie's New York 'Interiors' sale February 8th sand 9th. Look closely at the woman's face carved just below the dial. The design seems almost liquid as it pours on to your table top. 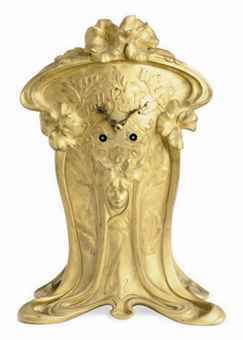 The clock stands 15.25" tall, and has an auction estimate of $2,000 - $3,000. For the real thing, this Louis Majorelle circa 1900 rosewood and gilt metal writing desk sold at a Sotheby's auction in New York for $10,000 (including buyers premium). It had an auction estimate of $9,000 - $12,000. It's just perfect! Almost no design element is left without a curve. I'm not sure if we have a trend towards Art Nouveau in decorating, but styles have been known to swing in popularity from straight lines to curves, and simple to ornate over time, and back again. 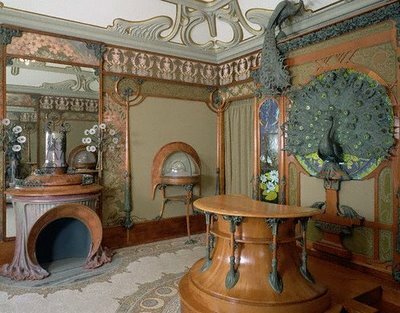 One of the wonderful things about Art Nouveau style is that it avoids the ornate, and just focuses on the organic and sensual design details. Maybe it's just what you need to break up the straight lines in your modernist decor. Art Noveau is a bit theatrical for me. 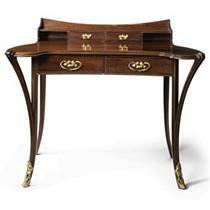 I will make an exception for the writing desk, which is perfection. I am fascinated that it is your most popular post. I might have to check google key words to see if it is increasing in frequency. That might be the tip-off. I will check out Bonhams. L.A. has a great deal of high quality A.N. It worked with the Hollywood regency look.